I’ve been seriously studying the shakuhachi since 1993. I started my studies with Michael Furuta, a student of Tadashi Tajima. 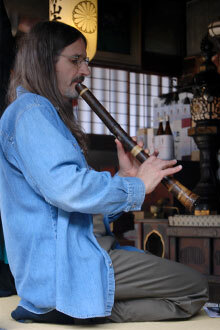 I met Michael Gould at the World Shakuhachi festival in Boulder Colorado in 1998 and have been taking lessons with him since around that time. For a more detailed description as to how I became interested in the shakuhachi please read my overview. My interests in the flute vary greatly, although I’m pretty much focused on traditional Japanese music. I enjoy playing Minyo (folk pieces), Sankyoku (older chamber music), Shinkyoku (more modern chamber music), and Honkyoku (the music of the Buddhist tradition.) I’ve done public performances and played for dance and yoga classes. I’ve even played for a wedding, but mostly I just enjoy playing the shakuhachi in the privacy of my own home. On April 25th in 2011 I attained the rank of Jun Shihan. This was awarded to me by my teacher Michael Chikuzen Gould. On April 25th in 2015 I attatined the rank of Shihan. Recently I've been playing with a local Koto ensemble (The Chicago Koto Group.) I also now have a few students of my own. More information may be found on my tumblr blog.